At the 8:30 am UN Logbase "transitional housing cluster" this morning, a meeting of (overwhelmingly white, non Haitian) representatives more than 25 NGOs and international aid agencies discussed the ongoing challenges involved in meeting the housing and shelter needs of Haiti's quake victims. An interesting new progress report was distributed, which indicated that as of right now, countrywide, there are an estimated 1.4127 mm "people in need of shelter," including precisely 282,538 households. 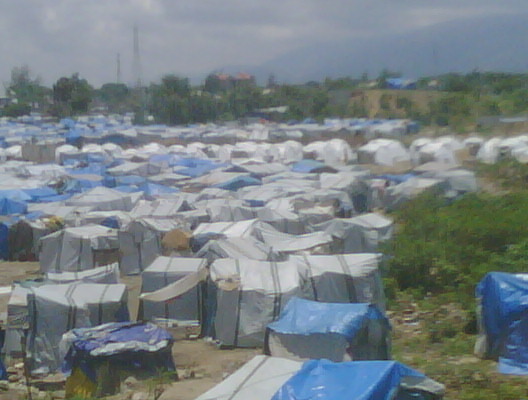 To meet the needs of all these people for housing, the UN says that to date 62,732 tents and 563,558 tarps have been distributed by shelter NGOs. In addition, they have doled out some 58,999 tool kits, 107,735 kitchen sets, 196,053 mosquito nets, 339,151 "hygiene kits," 150,994 sleeping mats, and 490,383 "blankets or sheets." On the housing front, the UN cluster leaders claim an overall coverage ratio of 113%, defined as the sum of "tents plus (# of tarps passed out, divided by 2)" -- though this ratio is still below 50 percent in a few big communes like carrefour (47%) and grande-goave (38%). Some NGOs representatives in the audience expressed some discomfort with these metrics, however -- especially given the fast approaching rainy/ hurricane season. For example, one rep from the Amer Red Cross suggested that perhaps "adequate drainage" or "ability to withstand high winds and rain" might be added to the success criteria. And another NGO rep suggested that perhaps the real answer was to accelerate the relocation of those in the camps back to "green" houses -- in cases where their original homes had been certified as sound -- and to speed up repairs to "yellow" houses, those which have damage, but are deemed repairable. He claimed that in many cases such repairs might be cheaper than the kind of temporary shelters that many NGOs have emphasized. The UN cluster group leader reminded such critics that his forum was only about "transitional housing," and that such "longer-term" shelter, reconstruction, and, indeed, land tenure issues would have to reserved for (some other unspecified) cluster meeting. To date the "transitional housing" cluster's efforts have raised about 63 % of the $122 million that was budgeted for all this activity through the end of May. The group expects to start another fund raising effort in June to complete its work on "transitional" shelter.